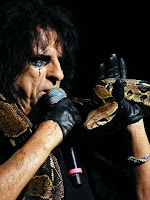 When I go onstage as Alice to this day, I play Alice to the hilt -- I play him for everything he is worth, but when I'm offstage, I never think about Alice Cooper. He never occurs to me. ... I walk off stage though and I turn away from the audience, I go back to being me again. Whenever I see an audience, that's when I turn into Alice. If there was no audience there, there would be no reason to be Alice. ... If I tried to be Alice Cooper all the time -- I'd either be in an insane asylum or in jail or dead. Alice is just too intense, and you just can't be Alice all the time.